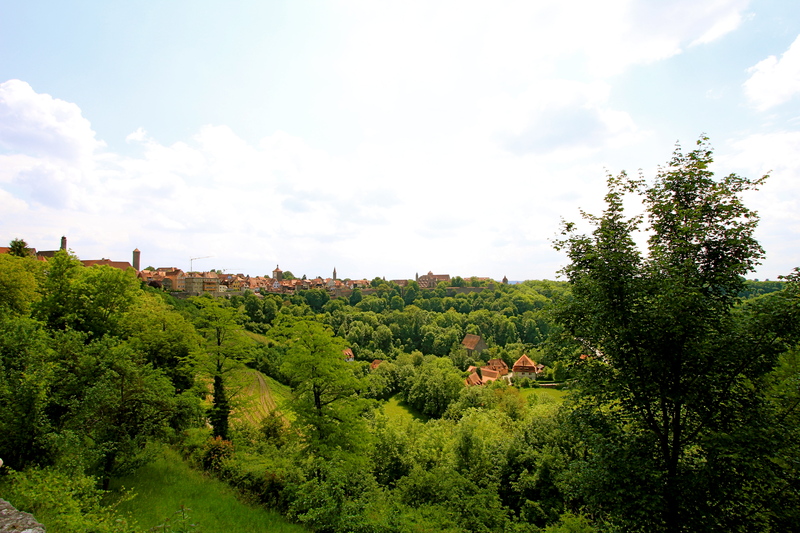 Day 1 of our week-long driving trip through southern Germany on our way to Venice, Italy was a stop in the picturesque, German village of Rothenburg ob der Tauber (Red Fortress above the Tauber River). 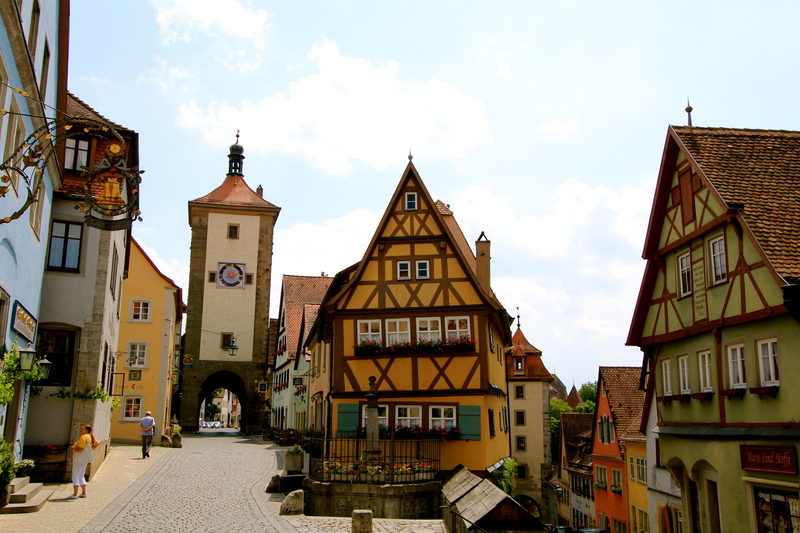 Rothenburg is a medieval town that has kept its architecture the same for hundreds of years. No commercial signs, television antennas, etc. 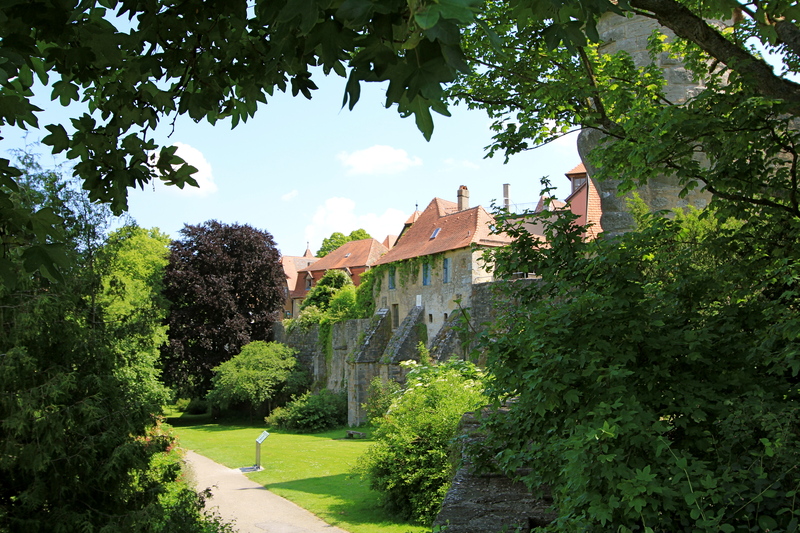 are allowed – keeping the village to look the way it did in the 1500s. It is a walled city that is still intact today with its fortified watch towers. 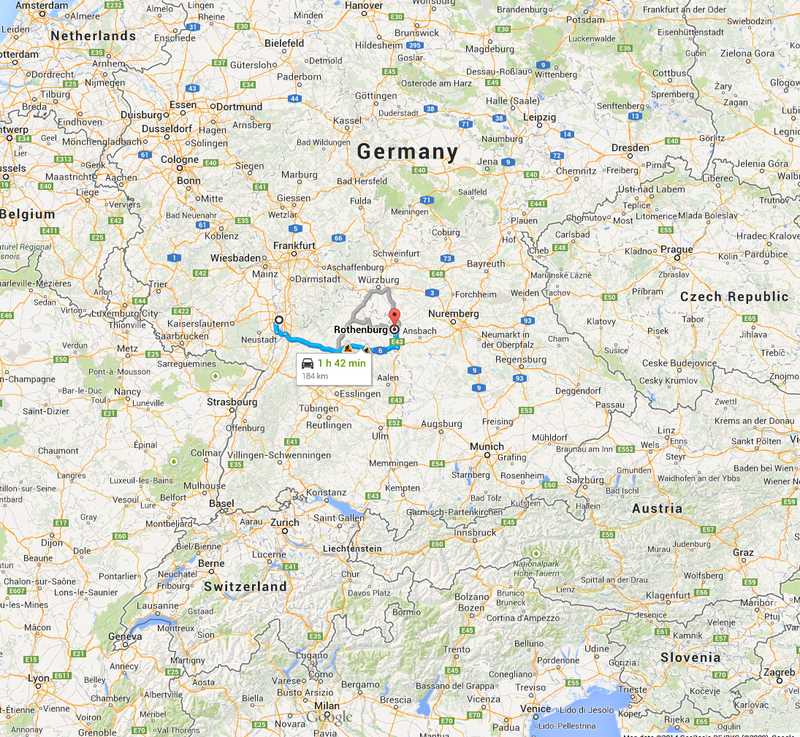 After only 90 minutes from our apartment in Ludwigshafen, Germany, we arrived in Rothenburg. One architecture style that I absolutely love in Germany are the half-timber houses. Wood is not used in the construction of homes or buildings in Germany. The only exception are the half-timber homes, that use large timber lengths as the load bearing members and then a stone or plaster filling fills the space between the timbers. In other words…a perfect “ginger bread house”. 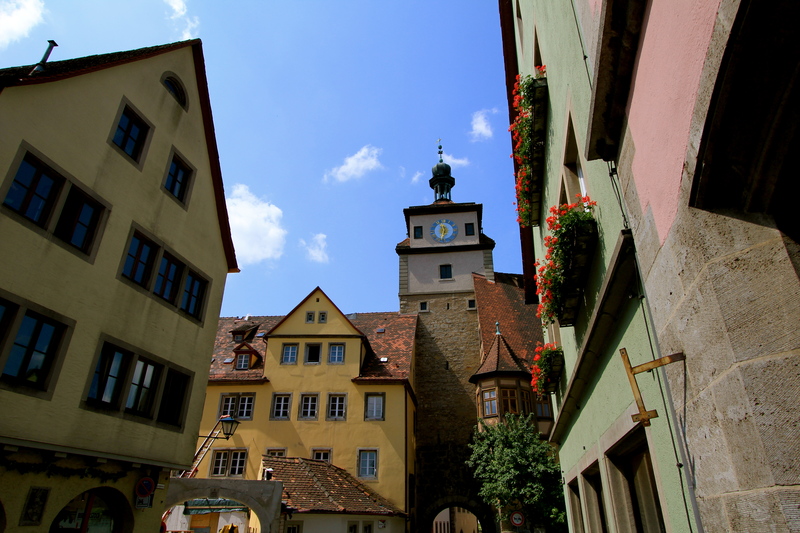 Also, in Rothenburg, the colors of the buildings are very pretty and the roofs all have red color in their tops, which helps give the town its name of Rothenburg (or Red Fortress). 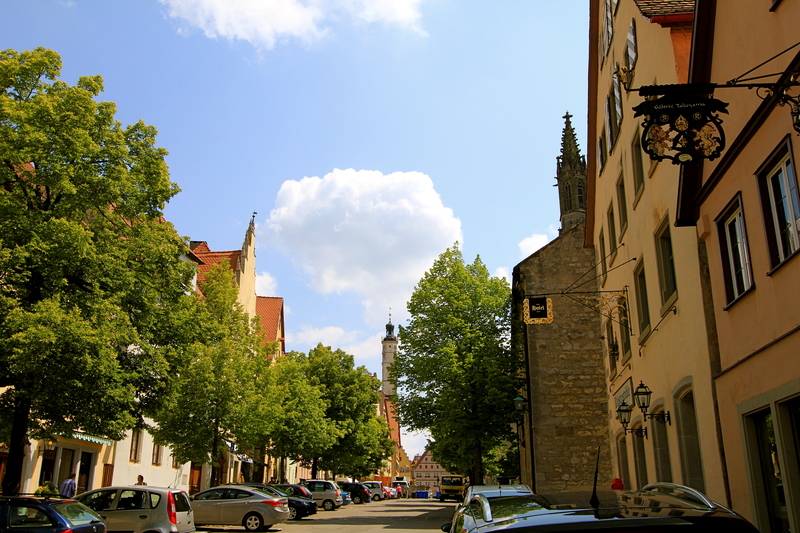 We had arrived early in the morning, as we had another destination to go….so we beat the tourist crowds, as Rothenburg is a popular tourist destination because it is an hour to the west of Munich. 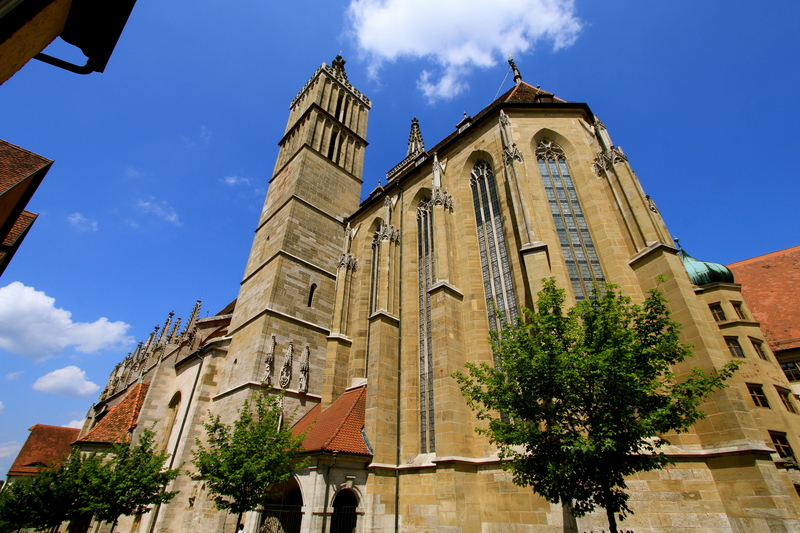 St. James Lutheran church cathedral in Rothenburg. Construction was between 1311-1484. 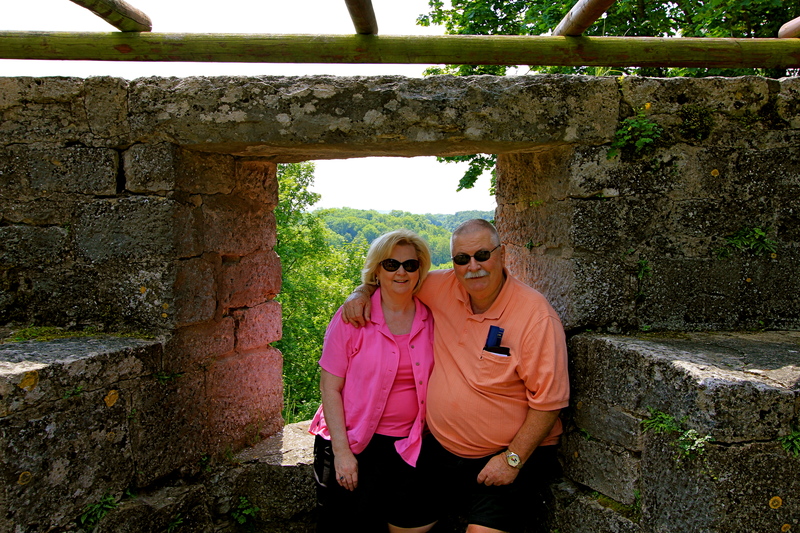 We walked through the center of the village to the other side of the exterior wall that encircles the town. From there, we found a little area to rest and to enjoy the view of the village. My parents found a little area to enjoy a break and the view. 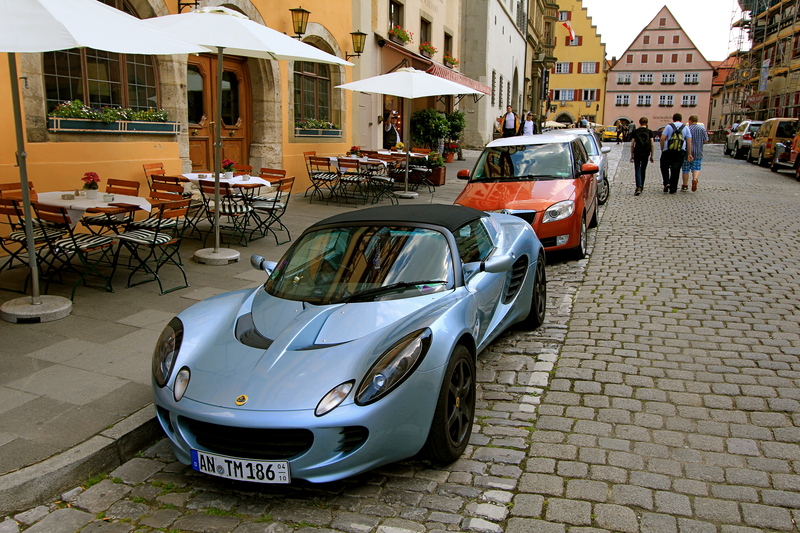 Walking back into the village, we entered the main town square and saw a fantastic little sportscar (Lotus) before we went inside one of the largest Christmas museums and stores. 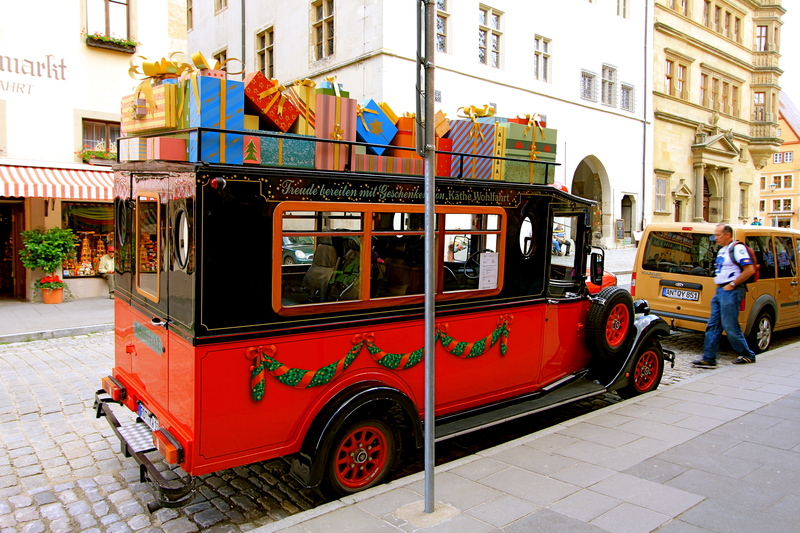 Rothenburg has a very beautiful Christmas Market in December, which we will plan to visit before leaving Germany. 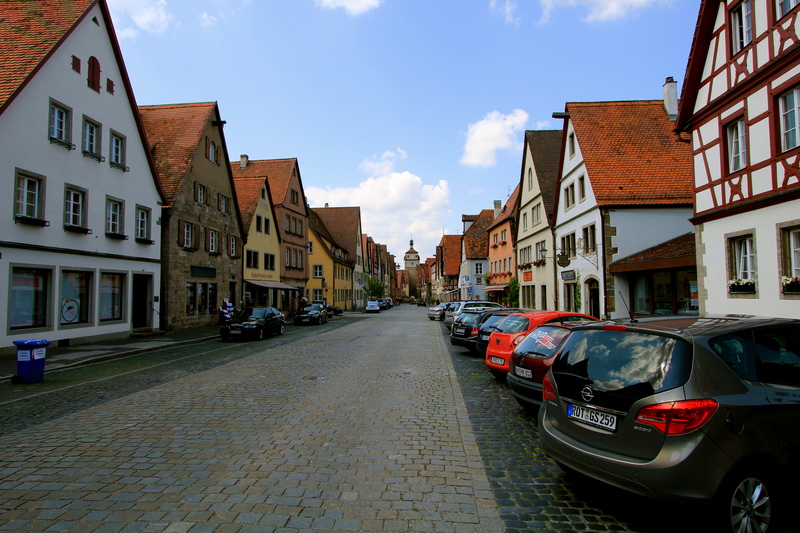 One of my favorite places in any German town is here in this area called the Plonlein Square (little flat square). 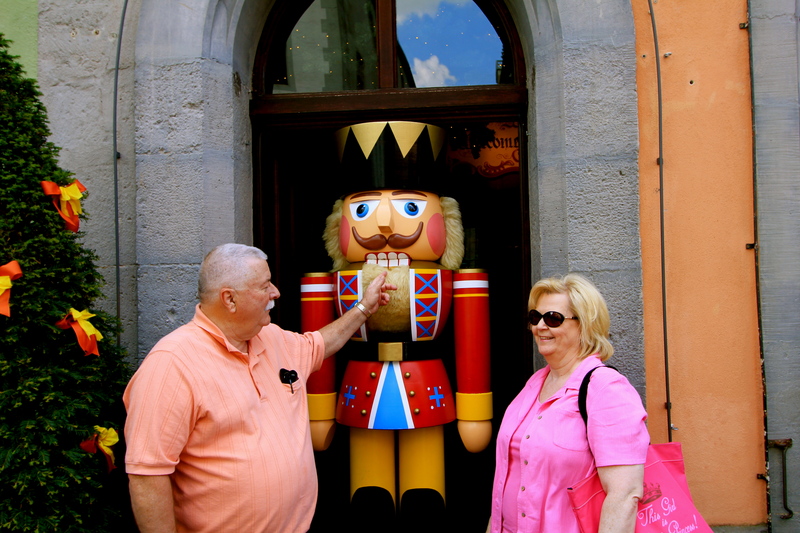 One of the most famous postcard images from Rothenburg ob der Tauber is definitely the Plönlein. 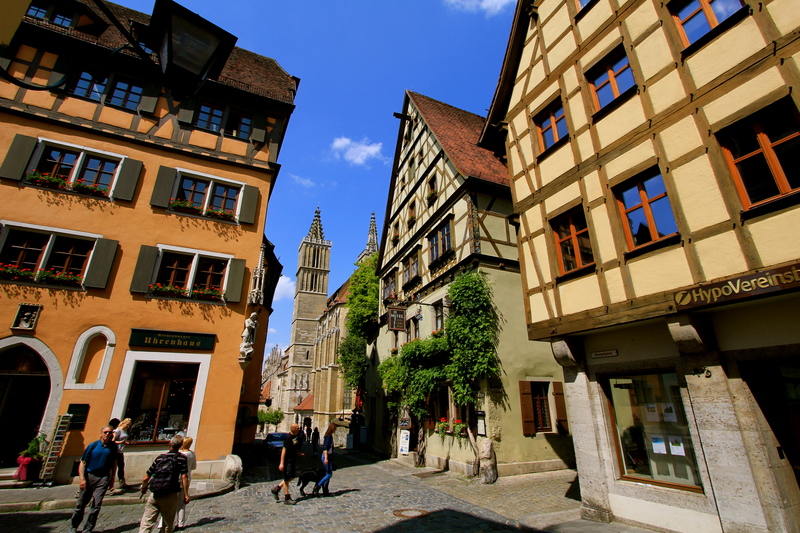 A narrow half-timbered building with a small fountain in front, it is framed by the Kobolzeller tower and the higher Siebers Tower, with townhouses to the right and left, creating a charmingly picturesque effect. The tower was built in the 1300s, and the houses in the 1400s. 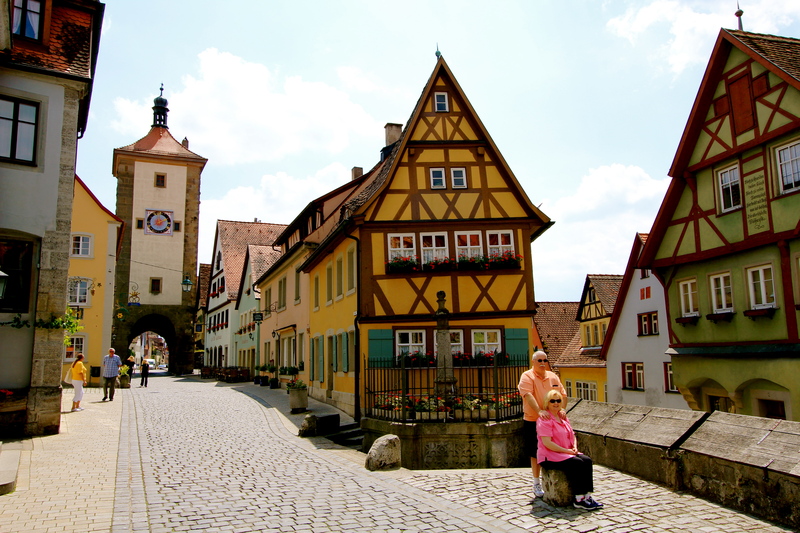 It is an iconic picture for Rothenburg….and I had to wait forever for cars or people to not be in this picture! 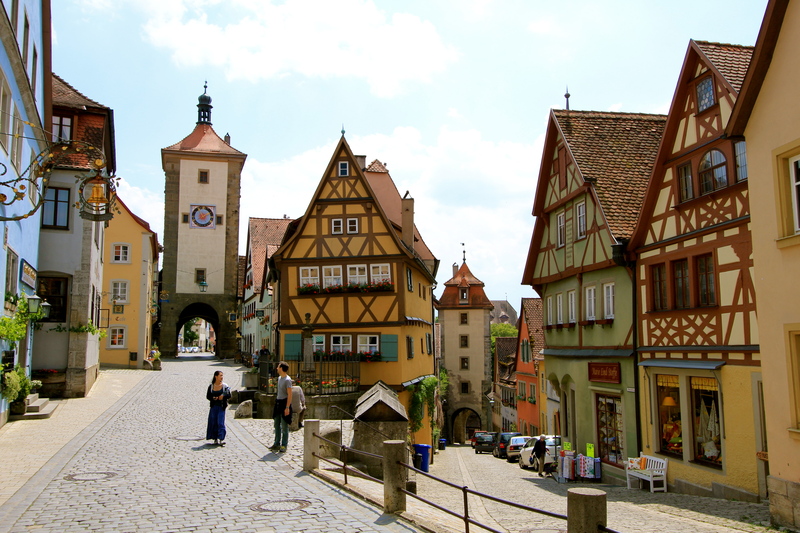 The American writer, tour operator, and travel TV host, Rick Steeves, has called Rothenburg one of his favorite towns, not only in Germany, but all of Europe. It has such a charm about it, and the village has kept the modern-day commercialism and growth outside of its walled city. Therefore, without seeing the occasional car pass by, the town looks the same as it has for hundreds of years…and to me…that is amazing.